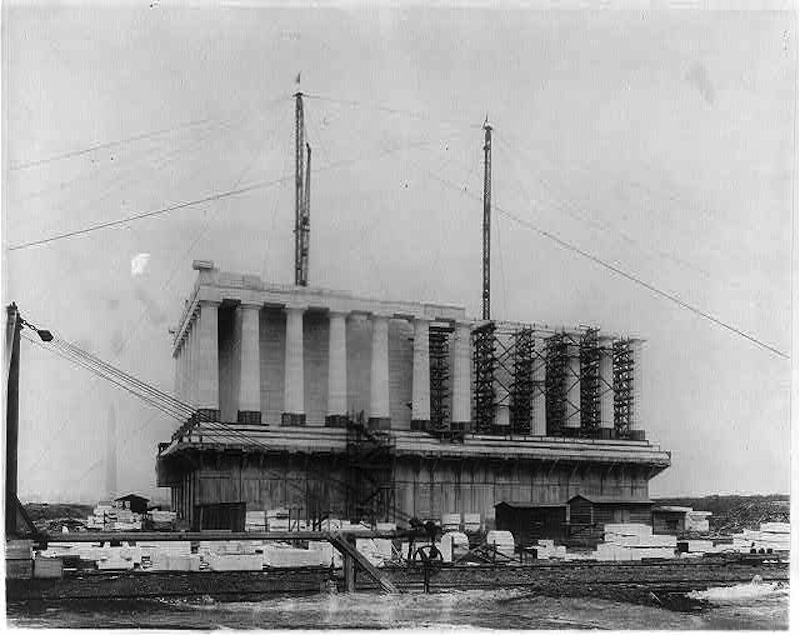 Henry Bacon and Daniel Chester French, “Lincoln Memorial,” Histories of the National Mall, accessed April 22, 2019, http://mallhistory.org/items/show/33. Constructed between 1914 and 1922, the Lincoln Memorial consists of a large, columned, classically inspired structure with a statue of Lincoln in the interior. Inscribed on the interior walls are Lincoln's Second Inaugural Address and his Gettysburg Address. The site has become a frequent stage for the civil rights demonstrations. African American opera singer Marian Anderson performed there after being barred from performing at then segregated Constitution Hall in 1939. In 1963 Martin Luther King, Jr. gave his "I Have a Dream" speech from the steps of the Lincoln Memorial. The structure is 189.7 by 118.5 feet, is 99 feet tall, and surrounded by 107 acres. Features a classical design with 36 fluted Doric columns made of Colorado Yule marble.